Take away the beautiful world of Walt Disney through Disney Magical Dice APK 1.0.5. This is the first Disney game for Android device, and it takes the surprise by storm. In a sense, Disney Magical Dice befits its name, as an online Monopoly board game that takes place in a wonderful Disney world. Many dearly beloved characters of your childhood can be played, as well as new characters from many new Disney movies and stories. Fun for the whole family, you can play this exciting alone or together with up to three other players. Get ready to experience the fun and exciting board game in one convenient device! Before you begin the adventure, a new avatar must be created. Of course, this customized character of yours can have many different customizations, all of them are inspired from the Disney characters. As a starter kit, players will be given their first costumes, based on characters such as Captain Hook, Rapunzel, Woody, and Maleficent. Many other customizations can be done by unlocking them in each different stage. The gameplay itself is similar to the common Monopoly game, with various additions. Players can win by many different means, such as owning the whole properties of their three different opponents, dominating every magic square on the field, or making the opponents bankrupt. For more fun, every costume bears different skills and stats that can affect your gameplay. Find out which costume that suits your gameplay the best. Although getting the costume cards for free can be done, you can also buy the costume cards with in-game currency or premium currency. Regardless, the excitement of each Disney character can be felt by everyone in a fun and unique customization of the Monopoly gameplay. 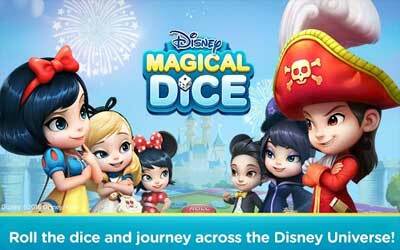 Disney Magical Dice for Android welcomes you to the wonderful and exciting world of Disney! Disney landmarks: Cinderella castle, Peter Pan’s Jolly Roger, Daisy’s garden… collect them all! Costume cards for your avatars: Cinderella, Maleficent, Snow White, Aladdin, Peter Pan, Woody, Buzz, Rapunzel, and more! The more you play the more costume cards you get! Card collection and power-ups: expand your collection of Disney costume card avatars and strengthen them through power-ups and fusion to be the best at the game! Global competition via rankings: COMPETE with international players as well as your friends. EARN rewards for winning!